will be on the perimeter. King has multiple receivers they can go to on any down, East English will look to their defesive backs to try to stop the highly praised passing game of the Crusaders. This game will also be the first Detroit Public School game of the week. The season has just started, and at this time I would like to mention some players that I think will become better known around the Metro-Detroit area by the end of the season. This list is in no praticular order. King Running Back Raymond Mitchell dives into the end-zone. 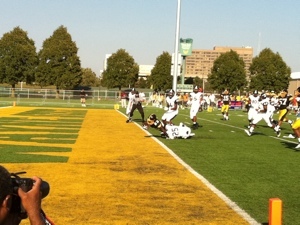 Detroit MLK scores a touchdown in overtime. 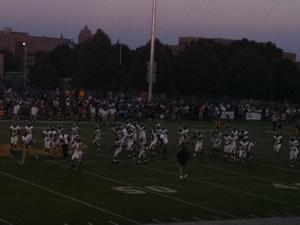 Southfield players celebrate comeback victory over Martin Luther King. 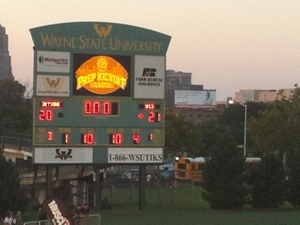 Final score Southfield 21 King 20. Cass Tech- If you could choose one word to describe Cass Tech, depth would be the word to use. Offense, defense special teams, it is amazing to believe that one team could have so much talent. The Technicians will be led on both offense and defense this year by Jourdan Lewis. The 5’10” Lewis, who has already committed to Michigan, will be used more has a wide receive this year. Which means quarterback Jayru campbell will have another weapon for his disposal on an already talent rich offense. Henry Ford- The Trojans were the surprise team of the PSL last year, making it all the way to the Division 2 championship game. Though they lose quarterback Victor Edge, the Trojans will have to win games in the trenches this year, and will be led by senior running back Jamall Sims. The Trojans will have to improve upon a defense that surrendered 49 points to Farmington last year in the playoffs. Cody- Look for Cody to improve upon on their sub-par season last year. Coach Calvin Norman will have no issues with speed this year. WR/DB Eddie Fulker and teammate Kenyon Bell ran a reported 10.5 seconds in a 100 meter dash. Western- The Cowboys will be going through a transition this year. Western is bringing in one of the most respected coaches in Detroit to their program: Andre Harlan. Harlan had impressive couple of years at Detroit Southwestern and will look to continue his winning tradition at Western. Following coach Harlan to Western will be sophomore running back sensation Romello Ross. Ross will be a major addition to an offense that struggled last year scoring only 109 points. Renaissance- Renaissance will look to make their first trip to the state playoffs since 2007. Coach Tyrice Grice will have a problem with experience this season. He has only 9 seniors on the squad this year. This young team will have to come together quickly as they open up the season against the always tough and well coached Farmington Hill Harrison. Northwestern- The Colts had a rough time scoring last season, which was shown by them being tied for second to last in the PSL in scoring. Northwestern should be huge on the interior with OG/DT Balaal Hollings. The running game for Northwestern, led by a pair 5’8″ running backs, should have a nice holes to run through. Mumford- Mumford had the leagues worst defense last year, giving up a combined 330 points. The Mustangs will have a good amount of their starters returning, which should help them improve upon the issue they had defensively. Mumford has a good leader in Donshell English who was the head coach at Southeastern when William Gholston was tearing up the Public School League. East English- East English is a combination of the old Finney High School and Crockett Tech. Most of the players will come from Crockett, a team that made it to the regional final last season, losing a close game to Marine City. Leading East English will be the dynamic duo of Desmond King and Khalid Hill. King, a RB/DB, will be counted on to hold down the secondary and create big plays in the running game. Hill is a TE/DE and has already committed to Michigan. Losing Quarterback Brian Blackburn will be a big loss, no doubt about it, but East English has enough skill players with starting experience to make it by. Douglass- The ‘Canes won the PSL Division 2 championship last year in large part due to an explosive offense that scored over 3oo points. Leading that attack will be 5’ 10″ athlete Demetrius Stinson, who acquired over 1,700 all-purpose yards while around 1,500 of those were on the ground. Fellow senior Kory Peterson will have to throw the ball consistently to open up the ground game for Stinson. Douglass should be solid on defense, particularly in secondary with Stinson roaming the backfield with Corner Omari McCauley. King- The Crusaders will have to replace Dennis Norfleet, who was the heart and soul of the team for the last couple of years. Instead of running the ball this year as effectively as they have done years past, King will have one of the most experienced wide receiver depth charts in the city. Mycial Allen and fellow Senior Devaun Williams should be an exciting Quarterback/Wide Receiver combination. Southeastern- Southeastern is coming off a 5-4 season in which they were held to under 6 points 3 times. Trying to help the defense will be LB Kenyatta Singleton. 6 starters will return on offense and 5 return on defense. Pershing- The Doughboys are coming off an impressive 7-3 season last year. Pershing has hired a new coach, Charles Spann, this year, and he will have the pleasure of utilizing the highly experienced Laron Kidd. Tommy Pearson is also expected to have an accomplished season this year. Denby- The Tar’s had a rough time scoring last season, being shut out 3 times. The defense was not that much better, giving up more than 40 points five times. They have hired Peter Karras, son of former Lion Alex Karras, to coordinate the defense which should help improve the Tars chances of staying in the game. Osborn- Will have only 12 seniors on the team this year. On the positive side, there are not a lot of players on the team, so the seniors will have a chance to play. Glancing at the size of the players, one thing that stood out was their height. Only three players will be above 6’3″. Central- Had a tough time scoring last year. The most points scored by the Trailblazers was 18. The defensive side of the ball will be led by seniors Calvin Hall and Terrance Barksdale. Head Coach Robert Hunt believes his team will have a multitude of senior leadership entering the 2012 campaign. The season is fast approaching, and I would like to take this time to share with you my opinions about the top Detroit Public School League Football games for this fall. There are some city championship notable games coming up in the next few weeks, but lets open up with a game worthy of a state final at Ford Field. What better way to start off a season than with two defending state champions battling it out in the new Detroit Prep Kickoff Classic. There should be plenty of scouts on hand for these two teams. It seems that at every position, Cass Tech has a future Division One recruit. Whether it be Jourdan Lewis at Corner, Damon Webb at receiver, Jayru Campbell at quarterback, Deon Drake at linebacker, just to name a few. Don’t count out Brother Rice in this game, especially with experienced running back Brian Walker pounding the rock in Coach Fracassa’s offense. 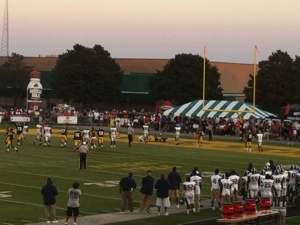 This year, the Detroit Public School League will introduce a new format for fall football. The new format will consist of two divisions, with one division carrying 8 teams and the other division being composed of 7 teams. The East Division will feature Central, East English, King, Osborn, Denby, Pershing, Southeastern and Douglass. Teams that will compete in the West Division include Mumford, Renaissance, Cody, Cass Tech, Ford, Northwestern, and Western. The new format will introduce both positive and negative outcomes. Negatives that the new format will present include the loss of old rivalries due to the fact cross-over games will only be played if teams do not qualify for the playoffs. Thus, traditional rivals, such as Martin Luther King and Cass Tech, will not be guaranteed to compete against one another. At the same time though, positives from the new format will include just one city championship game, which will hopefully be held at Ford Field as it was last year. Another positive with the new format will be less cost for travel. Schools will be closer together giving students and faculty a chance to attend road games which has been a problem lately for the PSL. Although the new format is not perfect, the new set-up will hopefully bring added attention to every game being played in the PSL every given week instead of one division receiving all the exposure. Don’t forget today is the first day of high school football in the state of Michigan, and two PSL teams will be in action. Henry Ford will play Pershing at 4:00 and Mumford will take on the Yellow Jackets of Detroit Country Day. Both games will be at Renaissance as part of the PSL Kick-Off Showcase Classic. My name is Steven and this is a blog created to display and showcase the talent within the Detroit Public School Football League. Over the past few years, I have personally seen talented athletes dominate the field of play in high school but receive no recognition at the College level. Their athletic talents demonstrated on the field might take them places where they could continue their athletic careers and become leaders of tomorrow. Please feel free to voice your opinions on who should be given consideration to be part of the conversation on this blog. My ultimate goal is to get athletes noticed by top-tier programs locally and nationally. Lets hope that a Detroit Public School League team will follow the great season Cass Tech had last year and bring a state championship to the city of Detroit.